I’ve written several times about using Lego in the classroom of late (here, here, here and (rather differently) here): let’s pretend it’s some kind of mid-life crisis, but one with some useful lessons. 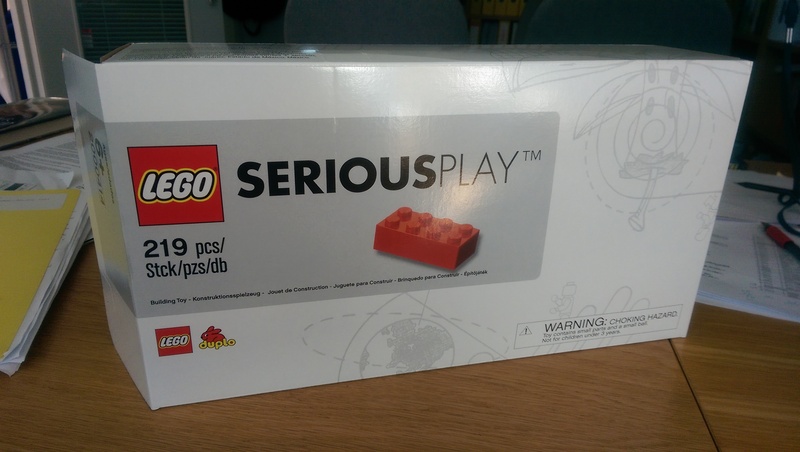 In the most recent of those posts, I was preparing for the use of Lego Serious Play with my Liberal Arts & Sciences group. I’ve now done that and I’m keen to report back. One of the recurring themes that I encounter in L&T circles is that we need to lay solid foundations for students, before then letting them run more freely, using more unconventional pedagogies. That makes some intuitive sense, especially if we take a more canonical view of ‘what must be learnt’. Free-spirited type that I am, I’ve always had some hesitation about this, since surely we want to introduce the breadth of possibilities early on, both to help hook in students and to valourise their role as learners. My trip to see Problem-Based Learning in Maastricht earlier this year reinforced that idea, and so it was that last week, in almost the very first class of the degree, I got my students playing with a pile of Lego. I put students into small groups of 3 and gave them 5 minutes to build a model of “A researcher, in their research environment”: they could pick up whatever they wanted from the pile and I gave no further cues to them. When they were done – initial scepticism having quickly disappeared – they presented their models to everyone else. I followed this up by asking them for ideas that this had triggered, be that in terms of the underlying assumptions they’d made, or the things they’d thought important. I’d expected perhaps a short list of things to come out of that last discussion, but 20 minutes later, we were still at it, with students making points that went well beyond what I could have hoped for them to achieve at such an early stage, not least because of their willingness to talk about how things interacted with each other. This kind of extended abstract thinking has really impressed me, not least because it was triggered by a very quick and simple exercise. The temptation to use it much more than I’d originally planned is rather strong. Of course, I would want to make some notes of caution too. Firstly, I clearly don’t have enough data to justify sweeping conclusions: my group was relatively small, with a mix of backgrounds that might have been conducive to the exercise. Having said that, everyone (without exception) contributed to the tasks for me, which suggests that there was some disinhibitory effect of playing with Lego bricks. Nonetheless, I might discover that they are always like this. Secondly, I’m also not sure about the impact of diminishing returns with such an exercise, certainly if we ran it in exactly the same format. The surprise when I produced the box of Lego was noticeable (even though I’d said we would be doing it), but I won’t have that again: likewise, there weren’t so many pieces in the box, so there’s a risk of just recycling ideas. Hence my inclination to take this in reserve for now, until we reach a point where it fits more obviously. However, taken together, I’ve been really happy with this as a trial: I got students talking and leading debate, I hope I have broken up the usual dynamic of the class and I have flagged that we are going to tackle our subject material in some different ways. All good stuff, as far as I’m concerned, even if I am going to try and lay off the Lego for a while.